The All Black Convention convened in Philadelphia. 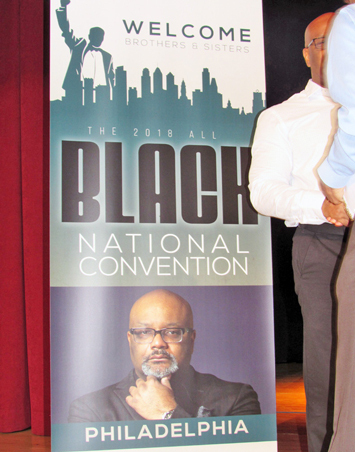 PHILADELPHIA—Financial expert and businessman Dr. Boyce Watkins and The Black Business School in partnership with Philadelphia’s IBuyBlack initiative recently sponsored the All Black Convention in the “City of Brotherly Love” at Audenreid High School. The convention brought aspiring entrepreneurs, current entrepreneurs and business owners from across the country, the Caribbean, Canada, and Africa together to discuss diverse topics such as asset mapping, religious factionalism, economics, education, group economics, nation building, generational wealth building, and family. What emerged from the September 27-30 gathering was a new creative prototype to be used for Black empowerment replacing the staid model which emphasized integration and voting, said organizers. The new model emphasizes the intentional education of Black children and significant economic development by Black people in Black communities. Ali Salahuddin of the Philadelphia-based African Genesis Institute and the IBuyBlack initiative told The Final Call that the convention was “real upfront” starting with the name. “There is no mistake as to what it is all about. You don’t see any sponsorship here from Wal-Mart or Coca Cola and the like. So it shows that we can independently do this,” he said. “The purpose of the convention is to enable us to share our ideas independent of any influence from outside communities. We have to be able to figure out the source of the problems that we face and present solutions that are wired to solve those problems,” Dr. Boyce Watkins said. “We need to bring together our best and brightest and to help them to gain the confidence to become visionaries. That means to see where our community will be in the next 50 years,” he said. Dr. Watkins added that it’s hard for Black people to follow a Black man that doesn’t dare to lead or implement and encourage the capability to build. “Minister (Louis) Farrakhan can build and lead, and Kenny Gamble is a builder as well,” he said referring to the Nation of Islam minister. Kenny Gamble of the famed Philadelphia music production duo “Gamble and Huff”, now known as Luqman Haqq is a businessman and activist in the city. “We are looking for Black people that want to build as opposed to those who are stuck in believing our only option is to integrate,” said Dr. Watkins. The convention seemed to bring to the forefront the “do for self” philosophy and vision espoused by Booker T. Washington, Marcus Garvey, and the Honorable Elijah Muhammad as the foundation for this new vision. Many in attendance viewed the conference as being solution focused. Jade Arrindell in attendance from Brooklyn noted the information presented on long-term wealth-building strategies, insurance options, aggressive stock market options, ways to build generational wealth, entrepreneurship as a means for creating freedom have all been invaluable and new concepts for the Black community to wrestle with to grow. “Education and economics go hand in hand. We have to take collective and individual responsibility for our children as well as financial freedom. It looks like building our own business and investing in industries and continuing to circulate the money in our communities and to buy Black,” she added. The foundation for the convention was laid out by Dr. Watkins in his opening remarks when he presented what he termed the “The Black Core of Three.” The Black community must educate their children, create jobs and support Black business. With that as the platform, the conference took off running. Other highlights included a keynote address by the well-respected economist Dr. Claude Anderson where he presented concepts such as “Doctrine of Unequal Exchange” where in the quest for social integration, Black people have given up everything including land and business and received little or nothing in return. He noted with this integration concept, “Black people were stuck on stupid with gorilla glue.” Dr. Anderson also pointed out that Black people have been the victims of fake news for centuries. “We must learn how to dominate and control what we use in the community,” he highlighted. Workshop themes included panel discussions on: Business Development, Technology, Millennial Entrepreneurs, Buying Black, Building the Billion Dollar Family and Black Love. Two remarkable films produced by Dr. Watkins also premiered entitled “Raising A Black Scholar” and “The Melanin Code.” Entertainment was provided by spoken word artist Mechee X, up and coming Philadelphia rapper Jay Ortiz and Chicago songtress London Lo. Mr. Kenny Gamble, who in concert with IBuyBlack co-sponsored the event and hosted it at the charter school he founded, participated in a panel discussion entitled “Buying Back the Block.” In it, he noted that Blacks must never detach from their neighborhoods. “We must learn how to control them.” He concluded that Blacks must also learn how to buy in bulk. “Look for places nobody wants and buy property there.” Mr. Gamble concluded that conferences such as The All Black Convention is what Black people should really get excited about. Muhammad Fard from the Albany, New York, Nation of Islam study group agreed. “It’s like the people here are working from the blueprint that the Honorable Elijah Muhammad left us. The base of his teachings was to pool your resources and do for self, and this is what the conference is all about. This is the working and outgrowth of the spirit of the Messenger and Master Fard Muhammad coming to fruition,” he said referring to Elijah Muhammad’s teacher. In concluding the conference, Dr. Watkins issued a charge to those in attendance. He said if you study history you will find there are lots of opportunities when White men fight each other. That’s how we freed ourselves from slavery, he explained. As Whites fight and argue Blacks should quietly grow in the background, he continued. “Next year I want you to become a better and different person,” he petitioned. “Advance yourself. Develop another stream of income. Confront your obstacles and fears in becoming a 2.0 version of yourself. If you have a business, acquire LLC status, and develop concrete goals far into the future,” said Dr. Watkins. “Most of all remember Blackness is greatness,” he concluded.